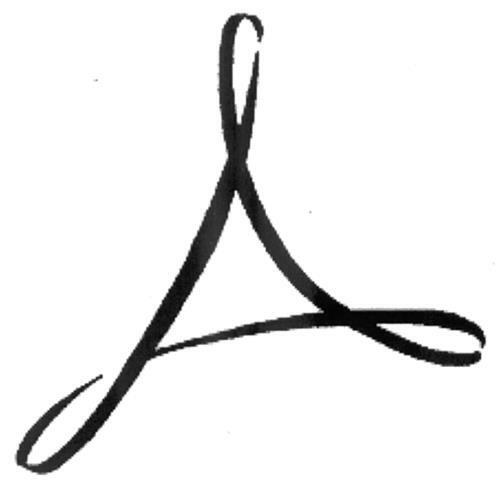 On Wednesday, December 3, 2008, a canadian trademark registration was filed for the above pictured logo by Adobe Systems Incorporated 345 Park Avenue, San Jose, California, 95110, UNITED STATES . The Canadian IP office has given the trademark application number of 1420556. The current status of this trademark filing is Registration published. The correspondent listed for is MARIE CAPEWELL of (M. CAPEWELL & ASSOCIATES INC.), Suite 303 - 1224 HAMILTON STREET, VANCOUVER, BRITISH COLUMBIA, CANADA V6B2S8 The trademark is filed in the description of Web-based multimedia teleconferencing services; web-based real-time, multimedia communications services, namely, electronic transmission of multimedia data and documents among users of computers and wireless communication networks; voice-over-internet protocol (VoIP) services. , Providing temporary use of on-line non-downloadable software for use in creating, editing, annotating, viewing, sharing, storing and distributing interactive electronic documents, namely, Portable Document Format (PDF) files; computer services, namely providing software updates via computer networks and global communication networks. , Computer services, namely, providing temporary use of on-line, non-downloadable software for word processing, for creating, editing, laying out, printing, organizing, managing, sharing and access control of documents, and for collaborative authoring and editing of multimedia documents; computer services, namely, hosting on-line web facilities for others for organizing and conducting on-line, real-time meetings, interactive discussions and presentations, featuring electronic data sharing, document sharing, application sharing, computer screen sharing and text chat. , Computer services, namely providing technical support, information and consultation services in the field of computer software and computer software development and design, all offered via computer networks and global communications networks; computer technology support services, namely, help desk services; computer software development and design for others; providing on-line support services for computer software users; computer programming services. , Computer services, namely, providing temporary use of on-line, non-downloadable software for word processing, for creating, editing, laying out, printing, organizing, managing, sharing and access control of documents, and for collaborative authoring and editing of multimedia documents; providing temporary use of on-line non-downloadable software for use in creating, editing, annotating, viewing, sharing, storing and distributing interactive electronic documents, namely, Portable Document Format (PDF) files; computer services, namely, hosting on-line web facilities for others for organizing and conducting on-line, real-time meetings, interactive discussions and presentations, featuring electronic data sharing, document sharing, application sharing, computer screen sharing and text chat. .
(1) - Web-based multimedia teleconferencing services; web-based real-time, multimedia communications services, namely, electronic transmission of multimedia data and documents among users of computers and wireless communication networks; voice-over-internet protocol (VoIP) services. (2) - Providing temporary use of on-line non-downloadable software for use in creating, editing, annotating, viewing, sharing, storing and distributing interactive electronic documents, namely, Portable Document Format (PDF) files; computer services, namely providing software updates via computer networks and global communication networks. (3) - Computer services, namely, providing temporary use of on-line, non-downloadable software for word processing, for creating, editing, laying out, printing, organizing, managing, sharing and access control of documents, and for collaborative authoring and editing of multimedia documents; computer services, namely, hosting on-line web facilities for others for organizing and conducting on-line, real-time meetings, interactive discussions and presentations, featuring electronic data sharing, document sharing, application sharing, computer screen sharing and text chat. (4) - Computer services, namely providing technical support, information and consultation services in the field of computer software and computer software development and design, all offered via computer networks and global communications networks; computer technology support services, namely, help desk services; computer software development and design for others; providing on-line support services for computer software users; computer programming services. (5) - Computer services, namely, providing temporary use of on-line, non-downloadable software for word processing, for creating, editing, laying out, printing, organizing, managing, sharing and access control of documents, and for collaborative authoring and editing of multimedia documents; providing temporary use of on-line non-downloadable software for use in creating, editing, annotating, viewing, sharing, storing and distributing interactive electronic documents, namely, Portable Document Format (PDF) files; computer services, namely, hosting on-line web facilities for others for organizing and conducting on-line, real-time meetings, interactive discussions and presentations, featuring electronic data sharing, document sharing, application sharing, computer screen sharing and text chat.